All Elite Wrestling has revealed ticket information and their charity partner for Fight for the Fallen. 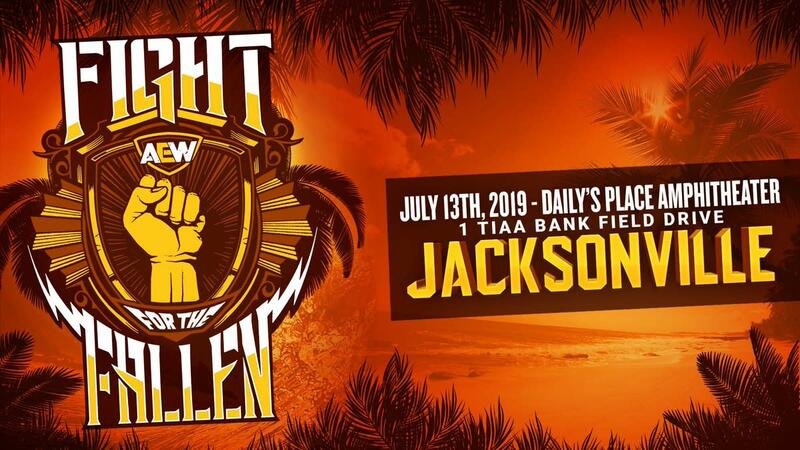 Fight for the Fallen is taking place at Daily’s Place Amphitheater at TIAA Bank Field in Jacksonville, Florida on Saturday, July 13. There will be a ticket pre-sale on Ticketmaster from 9 a.m. to 9 p.m. Eastern time this Thursday (April 18). "AEWFIGHT" is the pre-sale code. Tickets will then go on sale to the general public at 9 a.m. Eastern this Friday (April 19). Proceeds from the gate for Fight for the Fallen will benefit Jacksonville’s Victim Assistance Advisory Council. The organization "coordinates cooperative efforts among social service, criminal justice, mental health and other agencies to provide assistance to crime victims and their families. Cody, The Young Bucks, Kenny Omega, Chris Jericho, PAC, Hangman Page, Brandi Rhodes, and Allie were advertised for Fight for the Fallen in the press release. Fight for the Fallen will be the third show that AEW has put on. Double or Nothing is taking place in Las Vegas on May 25, while AEW and CEO Fighting Game Championships are partnering together for Fyter Fest in Daytona Beach, Florida on June 29.